In this lustrous and dark green jade with "sugar-brown and white" coloring, the brown sugar patterning dominates. This ts'ung tube with a round center and square outside is evenly carved and has a relatively neck long. The inside of the neck is round but not the outside, and only one end was cut at an angle. 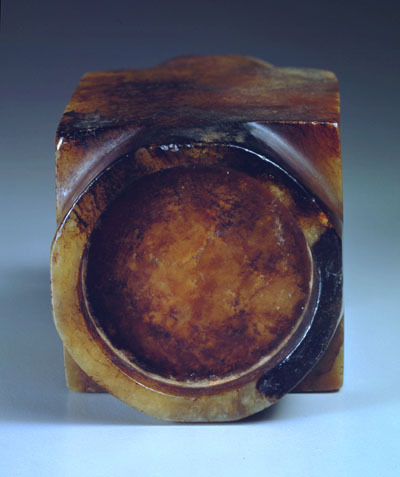 The bottom of one end was also fitted with a round piece of jade, which is a later addition suggesting it was "a bottom added to make a brush holder". One side was carved with imperial poetry. Three types of re-worked ancient jades were often done in the past. The first was to add contemporary engravings. The second was to alter the shape to make the jade object suitable for other purposes. 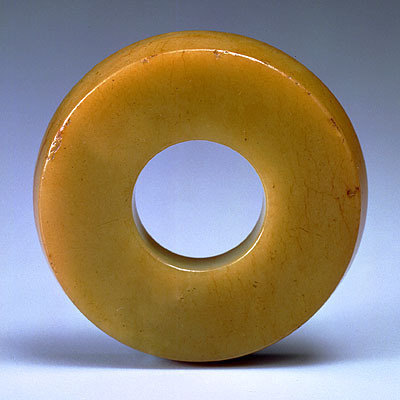 The third was to re-carve the jade to create a completely different object. Most re-worked pieces in this exhibit belong to the first category. Decoration includes typical Han dynasty styles that may have been later engravings of the Sung or even the Ming and Ch'ing dynasties. 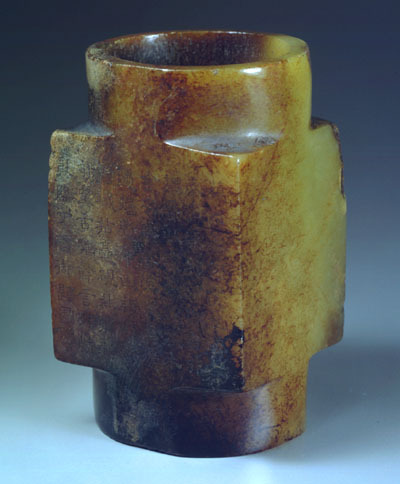 Many of the jades in the second category are ts'ung tubes, including one with a bottom added to make a brush holder and one adapted so that another object can fit the hole. Ancient prehistoric jades of the upper and middle reaches of the Yellow River valley provided an important source for later re-worked jades. One reason was that these jades were of prime quality. Although buried for centuries, the remained in excellent condition, which is no wonder why late Ch'ing and early Republican collectors and connoisseurs admired them as "Jades of the Western Land". The second reason is that even and large jade objects were especially suited for re-working. This dark yellow jade has striations and is lustrous. It was probably worked from the center cut-out of a pi disk. The edge is slanted, but the wall of the hole is straight. It also includes a wooden stand specifically made for it. This reworked jade from a pi disk center has evidence of circular drilling along the slanted edge, and the hole was drilled from one side. Excavations from Ch'i-ch'ia Culture sites in Kansu and Ning-hsia provinces have revealed many such pi disk centers, and they are similar to this one. 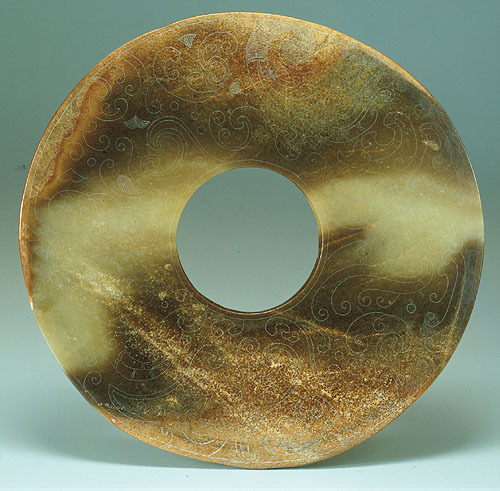 This lustrous jade pi disk exhibits the distinct "sugar-brown and white" form of coloration, which is caused by high amounts of iron. From the inside out, the order of the coloring is; grayish green to dark brown to light brown (the original surface of the jade stone). One side slightly protrudes, and the light brown areas at the top and bottom are slightly thinner. The hole and rim were damaged in places and polished smooth. Both sides are engraved with cloud and mist patterns, which suggest that this disk was reworked in the Han dynasty (206 B.C.-A.D. 220). The rim was also engraved with an inscription by the Ch¨ien-lung Emperor (r. 1736-1795). Pi disks with patterns of "sugar-brown and white" may have been deliberately chosen by the Ch'i-chia people in response to the appearance of, for example, the moon in an autumn evening. Or, perhaps they associated the colors of the sky with the natural coloring of the jade and thus attached a particular importance or belief to it.